SOUTH DAKOTA Farm Bureau representatives present 4-H Advisor Audra Scheel with a check to help improve the 4-H fairgrounds. Sanborn County 4-H Members celebrated improvements made at their fairgrounds on Monday, June 26, at noon during the Sanborn County 4-H Horse Show at the fairgrounds in Forestburg. 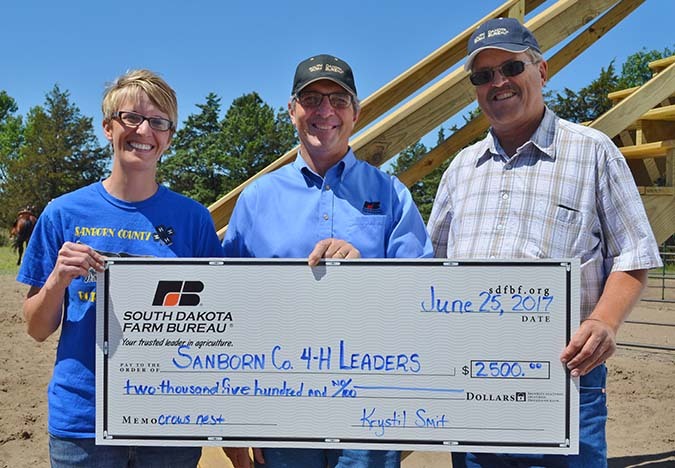 A newly built crow’s nest is the featured improvement, which is among the list of statewide projects funded through the South Dakota Farm Bureau Centennial Community Initiative. 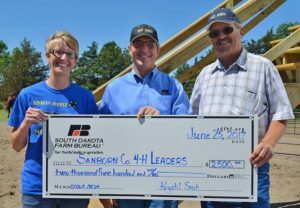 Funding for the crow’s nest was made possible by a $2,500 donation from the South Dakota Farm Bureau combined with a $1,000 donation from the Aurora/Jerauld/Sanborn County Farm Bureau. The Sanborn County Fairground project is one of the first of several SDFB Centennial Community Initiative projects that will be announced in the coming weeks. …To read more about improvements made to the fairgrounds, and to see a picture of the completed crow’s nest, pick up this week’s issue of the Sanborn Weekly Journal. YANKTON – First National Bank has provided a $2 million Equity-Equivalent Investment to Dakota Resources, announced Jeff Jones, Market President, First National Bank. The $2 million investment, which includes the renewal of an existing $700,000 Equity-Equivalent Investment from the bank plus an additional $1.3 million, reflects First National Bank’s commitment to building strong local economies in the South Dakota market. The investment will be used as loan funds to support businesses, affordable housing and other community development projects in the rural South Dakota counties of Yankton, Bon Homme, Beadle, Davison, Sanborn and Hanson through Dakota Resources Capital Investment Fund loans to development organizations serving those markets. Sanborn/Jerauld County USDA Farm Service Agency (FSA) Executive Director Kathy Torres announced acreage reporting for Sanborn and Jerauld counties need to be completed by July 17. Reporting acres after the 17th will result in a late fee being charged. “In order to comply with FSA program eligibility requirements, all producers are encouraged to visit the Sanborn/Jerauld County FSA office to file an accurate crop certification report by the applicable deadline,” said Torres. For questions regarding crop certification and crop loss reports, please contact the Sanborn/Jerauld County FSA office at (605)796-4476 ext.2.